Title: One For Those Long Gone! 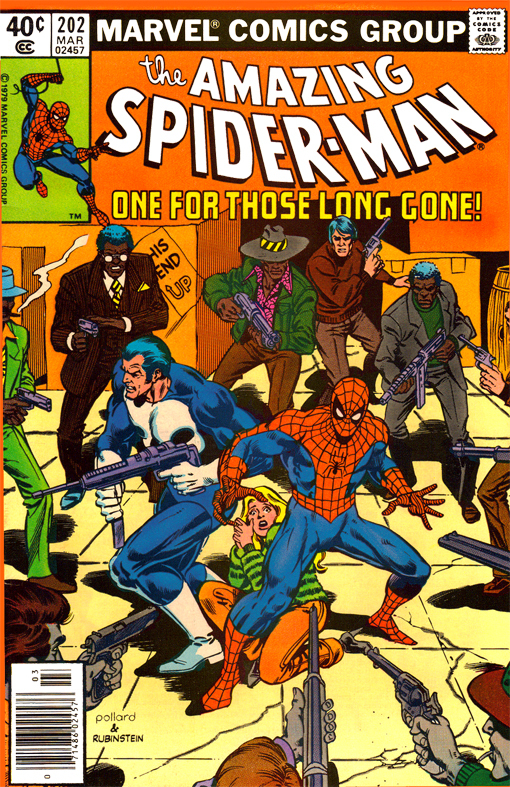 Synopsis: This issue picks up directly from Amazing Spider-Man #201 which closed with Peter Parker walking into his apartment to find the Punisher laying in wait. "I've learned your secret!" says the vicious vigilante. The Punisher thinks that Peter is in league with the criminals, but Peter tells him that he actually has a deal with Spider-Man to take his photos and split the cash. The Punisher is satisfied with this explanation and leaves, so Peter heads to work at the Daily Globe where he checks in with his editor Barney. Barney wants Peter and April to collaborate on the Jacobi story, but they part company to pursue their own leads and April poses as a drug courier to infiltrate Jacobi's organization. Peter visits the Daily Bugle where he finds that Robbie Robertson has stepped in to become the paper's publisher because J. Jonah Jameson is still acting erratically. Later, Peter suits up as Spider-Man and tracks down the Punisher, learning his dark history with one of Jacobi's suppliers who tried to kill the vigilante with a drug overdose. The duo uncover Jacobi's location after raiding one of his warehouses and burst in to capture the drug kingpin just as April is revealed to be a spy. A fight with Jacobi's henchmen ensues and the villain escapes in the chaos only to be run down by his driver who was rushing to escape the scene. Justice is served!